My year, according to Negan. Negan is a character on The Walking Dead, played by Jeffery Dean Morgan. He has filled the hole in my heart that Alan Rickman left, and is my not-so-new celebrity crush. I got to meet him and it was one of the best days ever. He plays the main character in today's post. 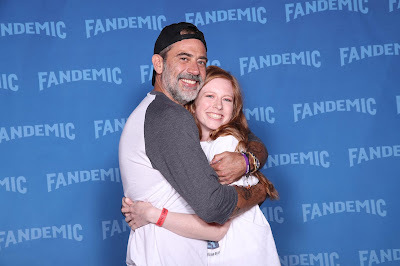 Negan is a bad guy in the show. He also swears a lot. So gifs featuring him will feature swear words. You have been warned (mother). For those of you who missed it, my year sucked. It started off on a bad note, and just got worse. I wrote a depressing blog post about it back in June or something, if you'd like to read it. And now I'm writing about it again. I was actually going to post this version back in June, but my depression from the event was so bad that, to fully process my pain, I wrote the depressed post instead. I'm also writing this because my non-morbid sense of humor is starting to revive, and I'm able to talk about this experience in a humorous way. Don't get me wrong; even during the darkest moments, I saw the humor in this situation. Like, what were the odds? Life has gotten better since then. So, this is a follow up post and a recap post to make you laugh with me about how terrible this event was. Kapeesh? Hilariously enough, New Years Day was the day I watched The Walking Dead (TWD) episode that first introduced Negan. January was also the month that my ex (whom I had exchanged "I love you" with) started dating his new woman. This took place less than a month after we broke up. Oh, and he lived in the building across the street from me. Also, when we broke up, I made him promise to give me a heads up before he started dating someone. I found out when my bestie saw him holding hands with that girl. In his defense, when I approached him about it, he said he was going to tell me later that day. But . . . the situation didn't make him look good. We had only just begun the nightmare that would unfold. February is generally my least favorite month of the year. And this year it was just a small step worse than usual. First of all, it was dark all the time. Then, I was in difficult classes I didn't particularly enjoy, and lastly, Valentine's Day takes place then, and it is my least favorite holiday by far. I couldn't fully escape the heartbreak situation because my ex lived so close to me and I kept running into him / his woman.When I didn't run into him, I had constant anxiety about the possibility of running into him. Oh, also, I started going on dates again. I was finally starting to recover a little bit. Salt was beginning to wash out of the wound. Honestly, I think I would've moved on a lot faster if I wasn't in such close proximity to my ex. So, I was looking forward to move out day next month, where I'd be staying in the same complex and he'd be peacing out. And that's when I found out that, come April, my ex's new woman would be my next door neighbor. WHAT. ARE THE FREAKEN. CHANCES?! Also, I learned that my ex wouldn't be leaving the state at that time like I originally thought. Oh, no. He'd be moving in another complex . . . right behind my building. Spoiler: 2018 wasn't joking. And it had more in store for me. When I look back on April, I just kind of get this "blah" feeling. It was a total blur. To be honest, I don't remember specific details. But I know that, between this drama, finals week, therapy appointments, moving apartments and job hunting, I didn't have much time to think. Or time for happiness and self care, really. My memory of May is kind of the same as April. I began to reclaim my happiness. Aaaaaand then I was living next door to my ex's new woman . . . so that constant reminder made it difficult to remain happy and positive and move on. I remember I was tired all the time. This is when things got rough, and ended with a sign of hope. After continuously running into them at my apartment complex (also, he kept parking his car next to my car. Who does that? Does he not realize I could've easily keyed it, or slammed my door into his, or done what I actually wanted to do and put gummy bears on the hood of his car so that they'd melt? Don't worry. I didn't. No revenge or property damage was done. Only in my imagination. ), I found myself in the ER because of suicidal thoughts. It was actually a pretty positive experience. Ask me about it sometime, if you want. I sat on the hospital bed, tears flowing down my cheeks. I hadn't been able to stop crying for, like, two hours straight. I had zero control over my crying. It was the weirdest sensation. The nurse and doctor walked into the room. The nurse greeted me and said, "This is doctor so-and-so. I'm [ex boyfriends' name]. I'll be helping out with you today." The nurse had the exact same name as my ex boyfriend. Yes, 2018. Yes, it does. Because a week after I went to the ER, my ex got engaged to his lady friend. AND THEY WERE GETTING MARRIED ON THE ANNIVERSARY OF THE DAY HIM AND I STARTED TO DATE BAHAHAHAHAHA. WHAT ARE THE FREAKEN CHANCES?! I went to Africa at the end of the month!! July was amazing. I was in Rwanda and Uganda learning about the Rwandan genocide, peace building and conflict resolution. I saw animals I had wanted to see since I was little, I got to hear speakers who experienced the genocide themselves, I met amazing people and made wonderful friends who changed my life. I was in Africa! It was just an extremely good, soul healing time for me. I can't express how happy I am that I had the opportunity to go. It. Was. Amazing. For the first time since probably December 2017, I was actually happy. This was when my ex got married. So I ran away to Disneyland with my friend that weekend. Top 10 best decisions of my life, right there. Sadness still lingered, but it wasn't so much about my ex anymore. I was sad about other things, and weirdly enough . . . that made me happy. I felt more in control of my happiness and my life. There were / are still hard times, and they were mixed with hope that wasn't there before. I still have moments of sadness, jealousy and depression. To be honest, I'm not where I thought I'd be in life at this time. The biggest disappointment I'm experiencing is that I'm not living in D.C. or NYC like I had been planning on since 2016. Instead, I'm still in Utah. The east coast didn't work out. As hard as I tried to make it work out, the universe had other plans. My heart is still sad about it. I'm hoping I'll still be able to get back there very soon, but we'll see. I'm not where I want to be, and it's where I am. And it doesn't mean my life isn't good or fulfilling. I have a new job at an honest company while being surrounded by good people. I have the dog of my dreams. And after the start of this year, I'm more than happy with that. I do have to thank my ex, though. Because he's the one who got me hooked on TWD.